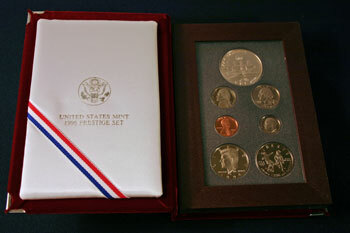 The 1996 Prestige Set returned to an Olympic theme by recognizing the Centennial Games held in Atlanta in the summer of 1996. 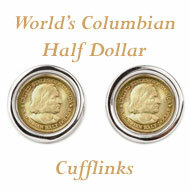 The two commemorative coins, a silver dollar and a clad half dollar, recognized rowing and soccer respectively. 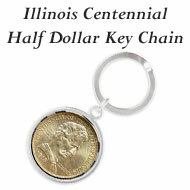 With the standard proof set coins and the commemorative coins, the prestige set contained seven coins with a face value of $2.41. 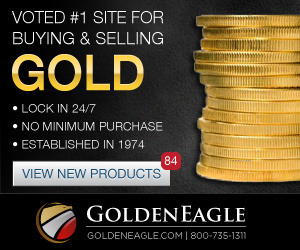 The initial purchase price from the US Mint was $57 which would be $79.06 in 2010 dollars using the Bureau of Labor Statistics' Inflation Calculator. 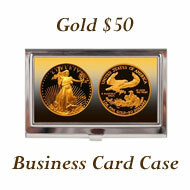 The US Mint continued with similar packaging as with earlier sets. Without the notation on the front of the box, the 1996 Prestige Set could easily be confused with earlier burgundy sets such as the 1992 set. The two-piece box measures 5 1/4 inches by 7 3/8 inches by 1 5/8 inches. 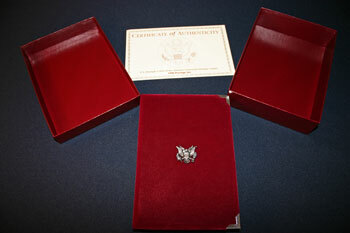 In the center of the box lid, the heraldic eagle poses in silver print along with "UNITED STATES MINT 1996 PRESTIGE SET." The padded, plush burgundy velvet book holding the proof coins nestles snugly inside the two-piece box along with the Certificate of Authenticity. 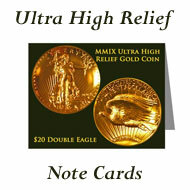 As with earlier sets, the metallic emblem of the heraldic eagle is centered on the front of the velvet book. Metal corners protect the velvet edges of the book. 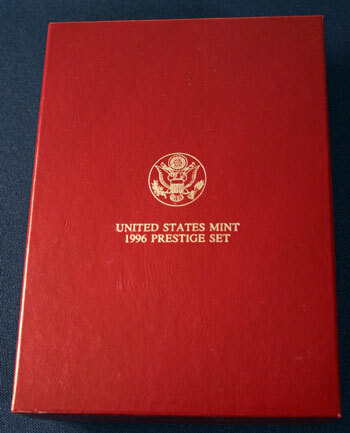 Opening the book, the heavily padded front cover contains another heraldic eagle in silver print centered over the inscription "UNITED STATES MINT 1996 PRESTIGE SET." 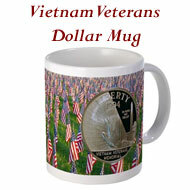 A red, white and blue ribbon attaches across the lower left corner making a triangle. This ribbon can hold the Certificate of Authenticity inside the book with the coins. 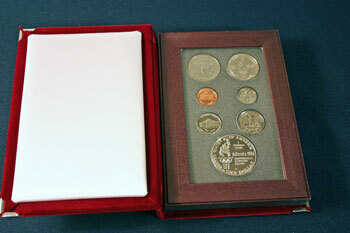 On the right, the seven proof coins - two commemorative and five standard coins - are positioned securely and protected between two clear pieces of acrylic. 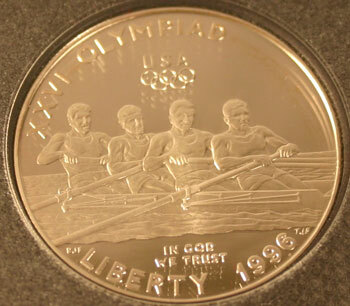 The commemorative silver dollar graces the upper position and recognizes the athletics associated with team rowing. In the lower right, two women play soccer on the commemorative clad half dollar. For the reverse view, the inside back cover contains heavy padding behind a white cover fabric. 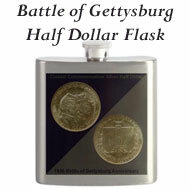 This protects the clear cover over the coins' reverse images. 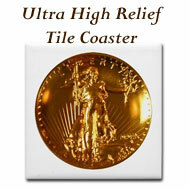 The commemorative silver dollar highlights the sport of rowing which has been in the Olympics since 1896. But bad weather prevented the competition in 1896, thus rowing officially began in 1900. Currently, the Olympic games includes fourteen different rowing events, eight for men and six for women. In competitive rowing, a coxless four is a rowing boat designed for four people. Each person uses one sweep oar. Two rowers row on the stroke side (rower's right) and two on the bow side (rower's left). The rudder is controlled by one of the crew, normally with the rudder cable attached to the toe of one of their shoes. The steersman may row at bow (left) since that position has better vision when looking over their shoulder. On straighter courses, the steersman may row on the stroke (right) side by keeping the stern of the boat pointed toward a landmark chosen at the start of the course. 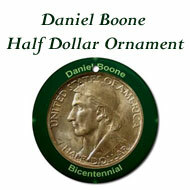 Perhaps the gentlemen on this coin are rowing their way across Lake Lanier. 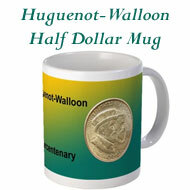 Above the rowing team and to the left, "XXVI OLYMPIAD" follows the rim of the silver dollar. Centered above the rowing team, "USA" resides above the five Olympic rings. Under the team, "IN GOD WE TRUST" is centered above "LIBERTY 1996" along the rim. 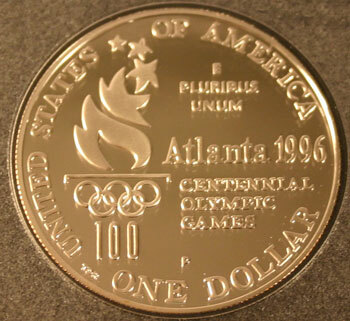 The reverse of the silver commemorative dollar shows the logo of the Atlanta Olympics, a torch made of the number 100 and the Olympic rings with stars rising out of the flames. 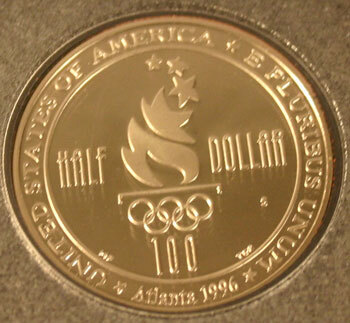 Several inscriptions are positioned on the reverse of the coin: "UNITED STATES OF AMERICA" around the rim, "E PLURIBUS UNUM" to the right of the flame, "Atlanta 1996" and "CENTENNIAL OLYMPIC GAMES" to the right of the torch. 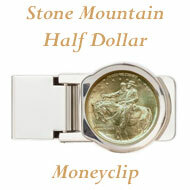 On the rim below, "ONE DOLLAR" identifies the denomination of the coin. 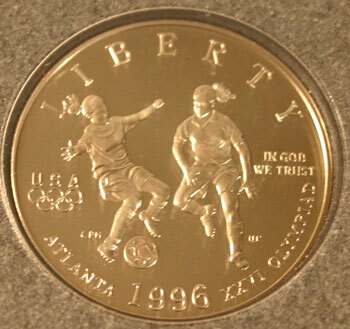 The commemorative clad half dollar shows two women playing soccer. On opposing teams, one prepares to pass while the other attempts to take control of the ball. The 1996 games introduced women's soccer to the list of Olympic events. "LIBERTY" resides on the coin above the soccer players. On the left, "USA" and the Olympic rings along with "ATLANTA 1996 XXVI OLYMPIAD" around the bottom rim recognize the Olympic sports. To the right of the soccer game, "IN GOD WE TRUST" is inscribed. On the reverse, the Atlanta Olympic logo is centered vertically with "HALF DOLLAR" centered horizontally across the coin. 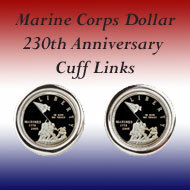 Around the rim, "UNITED STATES OF AMERICA," "E PLURIBUS UNUM" and "ATLANTA 1996" circle the coin's reverse. The opening ceremonies began on July 19 and were officially opened by President Bill Clinton. Muhammad Ali lit the Olympic torch and was awarded a replacement gold medal for the award he won in the 1960 Summer Olympics. The XXIV Olympiad in 1996 marked the centennial of the first summer games in Greece in 1896. 197 nations participated sending 10,320 athletes, 6797 men and 3523 women to the games. Softball, beach volleyball and mountain biking also debuted at the 1996 games. Carl Lewis returned to the Olympics to win his 4th gold medal in the long jump at the age of 35. Wearing his trademark gold shoes, Michael Johnson won gold in the 200 meter and 400 meter events. The US women won gold in the first ever women's soccer event. 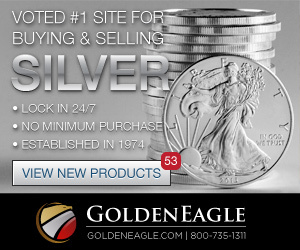 The US won 101 medals: 44 gold, 32 silver and 25 bronze. The games closed on August 4.